Learn Spanish in Santiago de Chile at our partner language school, Ecela. 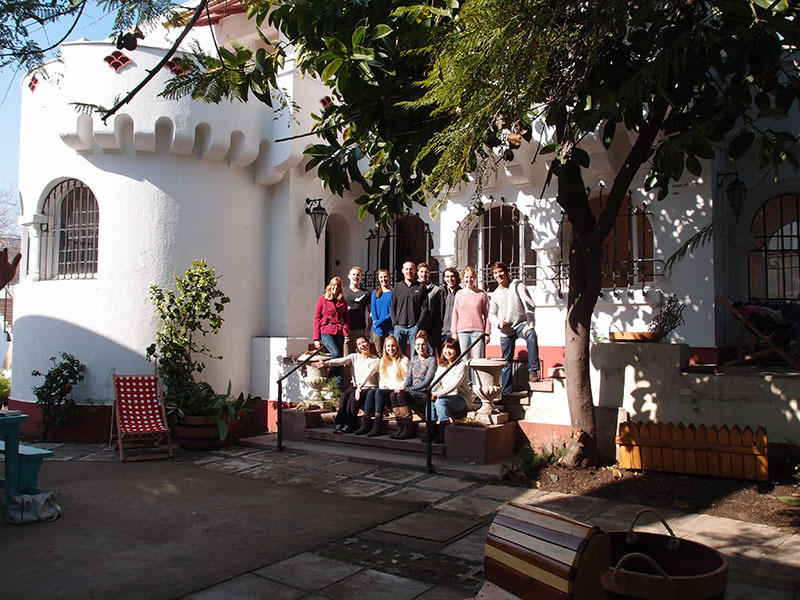 Ecela is located in the city of Santiago de Chile and provides an ideal setting to learn Spanish. The school is located in a beautiful renovated three floor mansion with a large patio and two terraces, in a residential neighbourhood called Providencia. Here you will find lots of restaurants, cafes, a public library, banks, supermarkets, the post office and parks. You are only a few minutes away from the subway and buses. The school building has comfortable classrooms, several bathrooms, common areas, a big outdoor patio, and two terraces. Furthermore, you can enjoy facilities like a table tennis, a large barbecue area, a small library, computers with internet access and free Wi-Fi. You can make use of the nice, spacious kitchen and enjoy a coffee, tea and snacks during breaks. The school's maximum capacity is 140 students. Community areas with free internet access, where our students can enjoy the breaks. The Intensive Spanish Course in Santiago de Chile is the best way for a student to improve their level of Spanish and in the shortest amount of time. Small group sizes (maximum 8 but normally smaller) allow each student to receive substantial individual attention and feedback from the teachers. The course consists of 20 lessons per week (from Monday until Friday) with lessons focused on grammar and general language skills and conversation lessons. Teacher and classmates might change per period. Surcharge for a private bathroom when staying with a host family: € 65 p.p.p.w. The host families live at a maximum travel distance of 45 minutes from school; in case you want to stay at walking distance (less than 12 blocks) from school, you will have to pay a surcharge of € 56 p.p.p.w. In case of special diet requests (vegetarian, celiac, etc.) you will have to inform StudyTravel at the moment of booking, as there will be added a surcharge of € 56 p.p.p.w. The apartments are at a maximum travel distance of 45 minutes from school; in case you want to stay at walking distance (less than 12 blocks) from school, you will have to pay a surcharge of € 56 p.p.p.w. The price mentioned is for an airport transfer on arrival in Santiago de Chile. If you arrive before 9 AM or after 8 PM a supplement of € 37 will be charged. In 2019 the school is closed on: 01/01/2019, 19/04/2019, 01/05/2019, 18/09/2019, 25/12/2019 . The missed lessons on these days will not be made up. Only individual classes will be rescheduled. The combined spanish course in Chile involves both group lessons and one-to-one lessons during the week. The 20 group lessons take the form of intensive study and there are an additional 10 one-to-one lessons also. This variety of learning is popular with our students and a good way of practising the language. With Santiago sitting at the foot of the Andes, the capital city provides great access for local skiing and snowboarding opportunities. Nearby peaks rise to over 5,000 metres (19,000 feet), giving the city a remarkable backdrop. This is a once-in-a lifetime opportunity and simply cannot be missed! The skiing course includes an intensive course of 20 lessons of Spanish per week. Furthermore, the skiing course package includes two day lift tickets to be used on weekend plus transportation (door-to-mountain). The prices of a 2 week course include a ski pass for 2 days, the 3 weeks course a ski pas for 4 days (2 weekends), etc. If you only wish to book one week, you need to book 2 extra nights of accommodation (until Sunday), please contact us for a price on request. Skiing lessons, ski equipment and clothing are not included. The ski season normally starts on June and ends on September (subject to the weather conditions). The ski-programme can be normally booked from June to September, but is subject to the weather conditions. transportation to and from the ski slopes. PLEASE NOTE Ski lessons, equipment and clothing are NOT included. *The prices of a 2 week course include a ski pass for 2 days, the 3 weeks course a ski pas for 4 days (2 weekends), etc. If you only wish to book one week, you need to book 2 extra nights of accommodation (until Sunday), please contact us for a price on request. In an apartment you live together with other students. There are single and double rooms available. You share the other facilities like kitchen, bathroom and toilet. Free wifi internet is included. Shared rooms include either double or twin beds according request. Apartments are located at maximum 45 min. travel time to school. If you wish to be in an apartment close to school, a supplement applies (please contact us). To make your language course complete, you may have us arrange a homestay with a local family. We strongly recommend this option as it allows you to practice and to improve your Spanish in a natural environment while also exposing you to the local culture. All host families are carefully selected and provide the student with a private room, kitchen access, and comfortable surroundings. Living standards are high and all host families are middle to upper-middle class. Most families are located at short distance from the school, but maximum distance is 45 min.